Kristine A. Lombardi worked in advertising for many years but is now a freelance illustrator and graphic designer. She is the author and illustrator of Lovey Bunny. She lives in Montclair, New Jersey. www.kristinelombardi.com. "... Lombardi's expressive illustrations and straightforward dialogue together deliver a benevolent, breezy tale... a sweet story about a boy and a dog rescuing each other." “Lombardi’s pencil-and-chalk illustrations are wonderfully expressive and empathetic. 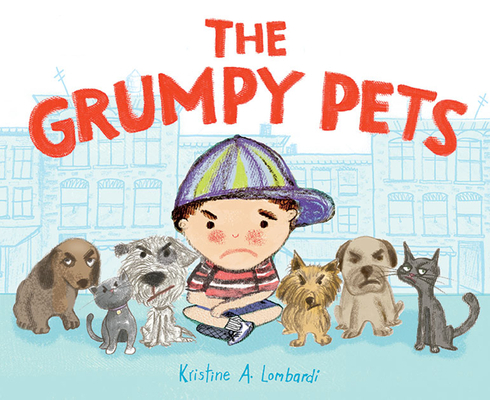 The cover features a charming array of frowning faces that will be a magnet for young readers. Some drawings portray scenes of cute kids, kittens, and puppies, but the glaring and narrow-eyed staring from the grumpy group will really tickle audiences. This lovely story begs to be read aloud, and it will resonate with animal lovers as well as with readers who have ever had a few (or more) grumpy moments of their own." "Billy’s permafrown worries his mother. She takes him to an animal rescue to find a pet, but the cuteness leaves him cold. Feeling left out, he follows the growls and hisses to the back. An array of ornery pets awaits, including the dog of his dreams, a glum wiry-haired fellow with downward-tilting eyebrows like Billy’s. With pastel illustrations as winningly shaggy as her heroes, Lombardi (“Lovey Bunny”) strikes a blow for the littlest grouches — and the overlooked rescue pets who need them."